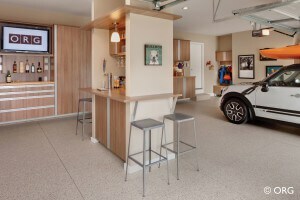 When you decide that you want to install a garage organization system for your home, the first thing you want to know is who is going to build it for you. There are a lot of businesses out there, and finding the right Atlanta garage organization company for you and your home may take some time and research. These are the top three things you want to consider and ask during your search to find a business that will provide you with the garage organization that you want. There is a certain amount of risk involved whenever you hire a contractor to come to your garage and do some construction work. If an accident causes damage to your home, you want to know that the company has liability insurance to protect you, your family and the rest of your home. Be sure to ask the garage organization company if they hire subcontractors to come provide services. If they do, you need to confirm that their insurance policy will cover the subcontractors, or that all workers on your property are covered by the liability insurance. Injury to workers is also a possible, though unlikely, concern. Ask the business for proof of workers’ compensation insurance, to protect workers in the event of accident or injury. Once you have a short list of companies to consider, you want to find out about the work they do. You can, and should, ask for references and a portfolio of previous jobs to get a sense for the quality of design and construction; however, you can also save a lot of time by checking out the business online. Websites like Yelp, Houzz, Angie’s List and others offer customer reviews of all kinds of companies. Find out what previous clients had to say. Look for evidence that the business is professional, easy to work with, and provides excellent work. 3. Are They a Licensed Atlanta Garage Organization Company? Private contractors must be licensed by the state of Georgia to offer this type of service to customers like you. This is a license that they must keep up by demonstrating that they follow solid and safe business practices. The licensing process helps to protect you from contractors who are not prepared to follow required procedures during construction on your home. Ask the garage organization company to show you their license, and confirm that it is current. You should consider at least a few businesses providing garage organization before you settle on one. That way, you can make an educated decision about the company that will offer the best garage organization system for your needs. To start the process of turning your garage into an organized haven, request a free Atlanta garage organization estimate.